DURHAM, N.C. FEBRUARY 04, 2019 - Benjamin “Beno” Freedman, Ph.D., is named STEM CELLS' Young Investigator of 2018 for his groundbreaking work with organoids in studying kidney structure and disease. This award fosters advancements in the fields of stem cells and regenerative medicine by honoring a young researcher who is principal author of an article published in STEM CELLS that is deemed to have the most impact and to push the boundaries of novel and insightful research. 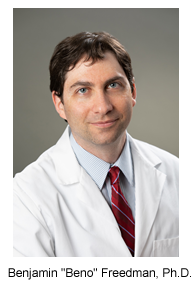 Read the paper that helped Dr. Benjamin Freedman earn the STEM CELLS Young Investigator Award, titled "Gene‐Edited Human Kidney Organoids Reveal Mechanisms of Disease in Podocyte Development." About the Journal: STEM CELLS, a peer-reviewed journal published monthly, provides a forum for prompt publication of original investigative papers and concise reviews. The journal covers all aspects of stem cells: embryonic stem cells/induced pluripotent stem cells; tissue-specific stem cells; cancer stem cells; the stem cell niche; stem cell epigenetics, genomics and proteomics; and translational and clinical research. STEM CELLS is co-published by AlphaMed Press and Wiley.